Since there are people out there who don't read digital comics—I count myself among them—I thought it would be important to note that you can find the print versions of Gods and Monsters: Batman and Gods and Monsters: Superman later in July (Batman on the 22nd, Superman on the 28th). 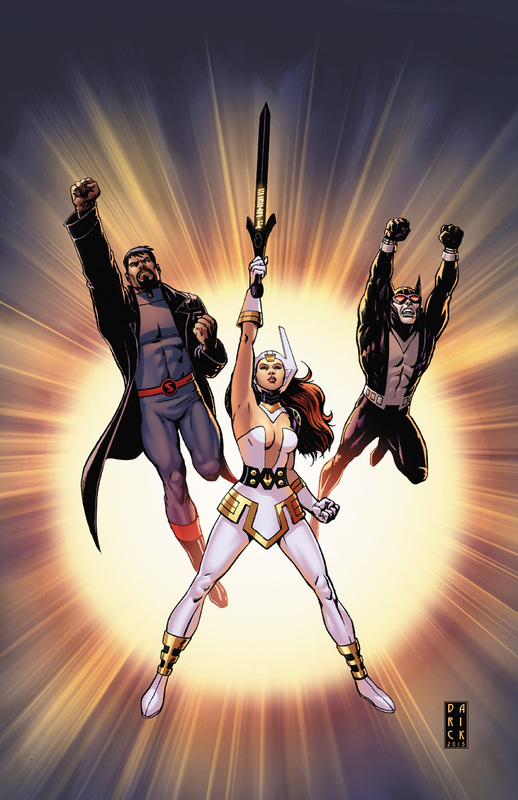 Gods and Monsters: Wonder Woman and the three-issue origin of the Justice League will be out in August—an issue a week, starting August 5th. And, if you're interested in more information about the project, you can head over to Newsarama, Comicvine and the Geek Cave Podcast where you'll find me talking (and talking and talking) about the series. I read digital comics for a simple reason. I am in France. And in France, the comic-shop who does comics in original version are ... pretty rare (except maybe in big cities, like Paris, of course). This is only true for the singles. For TPB and Graphic Novel, I do read in paper format and I only want paper format ! I need to smell a book times to times... and I buy a lot of TPB ahah. If only I had a comic shop just in my street (or just in my city...) where I can buy american single comic book, I couldn't be more please. So, digital still a fair alternative for me. I think digital is absolutely the wave of the future, Frey; I've just been slow to get on that train. I think there's a lot to be said for getting comics pretty much instantaneously on the day of release. And, from what I've seen, they loo fantastic on a tablet. too. I also think there are plenty of people who would never walk into a comic book shop who'd sample comics digitally—thus opening up the audience. That said, I was raised with print, so I'm attached to it. Took me a little while to get used to mp3s, too. But now the vast majority of my music is purchased that way. I still buy a lot of vinyl. I use mp3s if I'm riding my bike, but at home, it's vinyl. Since I live in Kalamazoo with the best comic shop ever, Fanfare Comics that has been there for decades I will continue to shop there. They have an epic 50 cent comics bin and always have huge markdowns on their hardcover graphic novels. I think monthly comics of the printed variety are going to become very much like vinyl, Douglas -- a product for connoisseurs and collectors -- which the general populace will be buying digital. How long it will take to reach that point I can't say; but technology moves fast and it may be sooner than I imagine. I fervently disagree. Not about physical comics being great, but rather about them becoming like vinyl. The problem with comics comparatively is one of numbers. Everyone listens to music. Seriously, everyone. So, even if the minority go for the rarer aspect it can still work. The people who buy vinyl are probably comparable to everyone who buys comics in the U.S. if not larger. What's more comic readers seem to be rejecting online comics. Marvel and DC keep trying online first comics and they keep failing. Batman has had two failures alone, and people either preferred the physical or didn't care at all. If anyone can move comics, it's Batman. I don't know if it's habit or the barber shop feel where it becomes a place to talk about things that no one outside cares about or we're just old. But the comic buying public seems to be more aligned with physical. Of course none of this even addresses the real problem, people don't read as much anymore. Online or physical if people aren't reading it doesn't matter. Once again, there also isn't very much cost benefit for going digital. The real question is, are comics time in the light almost done? Disney and Werner Brothers don't want comics, they the characters. When comics were doming well the companies didn't even want them. So once this fad ends in superhero movie--and it is superhero, they may be called comic movies but A History of Violence and Road to Perdition aren't counted-- and the fad WILL end, looks like maybe soon, why have comics in any form. The indie books won't be able to keep stores open, even the top-selling ones don't justify it. It is a symbiosis. And the problem with indie creative content on the internet is that you really, REALLY have to understand marketing to get someone to read it. Comics are in trouble. The only possible way to fix that is to acknowledge it. P.S. Douglas, you sound remarkably like a guy I know at my comic shop, but he lives here on the good...er,uh... other side of the state. But I think I went to Fanfare Comics when my brother lived in Kalamazoo. Do they have a used CD section? Let's check in about it in five years and see where things stand! I don't know if that's true. I feel like that makes my sound like a jerk, which I don't intend to, I just literally don't know. I do know that Marvel's sales numbers (after digital is included) show that some lower selling books are kept a float while other ones that sell more are cancelled. Some think because of forthcoming movies, and others that the origins are internet buzz... which doesn't translate to sales. I know that it seems that the big two are rearranging comics for things touching comics i.e. cosplay and films, which probably won't make a positive difference in drawing people in. It may even draw people out. I know that with every restructuring of the big two it seems each costumer at the store I go to drops more. I know that I have actually seen a rise in people checking out the graphic novel section at the book store in recent years. I know most people think the movies are taking crap and turning it to gold, while in reality they are dumbing down a lot of stories. I know that I've seen digital first comics tank multiple times. I know that indie comic companies printing online comics usually has a larger readership and actually increases traffic on the sites. I know at comic shows the comic section is not usually full of lines. I know keeping track of sales figures digitally when you have weekly releases and are trying to find out what is a hit and not can be very difficult. I know people who buy comics each Wednesday and don't read them for a few months, digital will change that purchasing habits. I have experience with larger companies who may want to cut out something that is doing fine, but not as profitable as they like. I know even if they do go all digital and continue it is most likely that you still won't have big enough to justify a vinyl type print run. This isn't supposition on my part, Jack, it's direct knowledge. There are comics that are surviving because of their digital sales. Doesn't mean digital has conquered the world (yet), but these are the facts. AS I said, just really didn't know. Now, I am going to resist every urge in my body which screams that I should ask for examples, and take your word. I hope you appreciate how big that is. However, rise of digital or not, I still feel that unless the big two face the facts that the medium is in trouble and really dig in and push forward. That's a very big "at some point," Jack. As for the future of comics...all I can say is time will tell. On a different topic, I wonder if comics craving of respectability is such a good thing. It seems like some of the best stuff comes from those who admit that it is at best a B-medium, and there for they can do more. It also seems the more serious it takes itself the more calculated, same, and less free it make itself. I think there's a certain freedom to be below-the-radar, to being looked at as a "B-medium." When the eyes of the world aren't on you, or when the world doesn't really care, you can relax, have fun, innovate. Thanks for the gift. Happy Fourth! That's what I love about self publishing. I do what I want when I want. Sure, I would love to have it make more money, but it makes me happy which is better than money. Exactly. Do you think that Starlin, Englehart, Lee, Kirby, or Everett could have done what they did if there were the eyes of expectations and limits that follow being widely known? For that matter how many of your stories would have never seen print if your medium was more mainstream. Sci-fi films and film noir (apparently) were considered b-films in the 50s, and they have stronger followings these days than other movie types of the era. Hell, sci-fi in all media has that stigma, and look at the kinds of stories they have gotten away with. To this day, there is still something so subversive about both the early F.F> issues and the Twilight Zone. I think that it allows you to throw yourself fully into your work,. and explode with passion, fear, self-loathing, love, joy, and everything else that makes great work. It's a similar thing with B films, as you suggest. They were working under the radar, low expectations...and you can get away with a LOT when no one's paying attention. There certainly weren't low expectations for TWILIGHT ZONE, but there was, I believe, a low budget—which meant that imagination and intelligent storytelling and to trump special effects. I don't know. While I am, no expert on TV stations in 1959 or what they were thinking, I could see and very easily believe that they thought, "Oh its just science fiction, its just for teenagers with bad skin" to borrow (and probably mutilate) a line from PKD. So, while there may have been expectation to perform, there may not have been any belief that it would be what it was. This may explain why the first season-season and a half had more dark episodes, while they were more scattered in later ones. But Serling was one of the single most revered and respected writers in TV. The very fact that he was doing TZ, although baffling to some, raised expectations. And once the show aired, the critics pretty much fell in love with it. Fair enough. A possibility may be that there was an expectation that it was a break from heady stuff. All I can say is that is a gut feeling and an admittedly tinted view of the era's prejudices of the genre. I'm sure everyone assumed that it would be a very good science fiction show... I just think that there were low expectations as to what that meant. As for the critics, I meant that it was low expectations before it aired. It also might explain why the first episode is not one of the more Earth-shattering ones, but the third one, "Mr. Denton on Doomsday," does deliver more than anyone may have assumed it would. That first one—"Where Is Everybody? "—was the pilot that sold the show and, if I'm remembering correctly, Serling very consciously left out any supernatural explanations so as not to freak the sponsors out. They'd be freaked out soon enough! I always really liked Night Gallery. Some of the images from those episodes are firmly stuck in my consciousness and I haven;t watched an episode in decades. Maybe we should move this discussion over to my TWILIGHT ZONE post! I don't love NIGHT GALLERY the way I do TZ, but it had some memorable episodes. The best, for me, was another Serling classic: "They're Tearing Down Tim Riley's Bar." Touching story and a wonderful performance by William Windom (also known as Commander Decker from the STAR TREK episode "The Doomsday Machine"). In its own way Night gallery was every bit the 70s that TZ was the late 50s and 60s. The problem was TZ had already swung the doors open. Then you factor in that Serling had somewhat less control if I remember. Yes, there were some very good stories. Though they had less impact and soul. Yes, they had soul... just not as much. Not to mention the goal was to be a horror series. Which makes me think that CBS didn't know what it was getting into with TZ. Night Gallery is a very good Horror/supernatural series. It was not the classic interpretation of the human ways that TZ was, maybe just because it wasn't supposed to be. Then of course there were already other shows filling the social commentary angle TZ had. The biggest show in the country was All in the Family. Serling got himself into a situation where he was the face of NIGHT GALLERY but had none of the creative control he had on TZ. Other people were running the ship. Plus, it wasn't in black and white! Black and white was such a huge factor in creating the tone and feel of the Zone. Superman the Motion Picture rule: The most important thing for a story is that the writer believe in the characters and their world. Superman 1978, is a goofy and corny movie. It can especially be seen in that light when viewed in comparison to the other films of the decade. However, the people who made it believe in it so much, and it comes off as so genuine that it's hard not to be sucked in and see past it. Then all that is lesft is the characters and the story. Warts and all, that remains my all-time favorite superhero movie. The movie was on TV last night, and I couldn't figure out why i liked it so much, I'm not even that much of a Superman fan. then it hit me. Actually, your favorite superhero movie is Superman vs. the Mole Men. I have great affection for the George Reeves Superman, but...no. Actually, my favorite episode of that show is the one where Superman tries to stop the meteor and gets amnesia. That was early on when they still did fairly serious stories. Well, unlike the Mole Men story, that stroy was not released as a movie beforehand. Of course that is all glossing over the bigger point, that I'm pretty sure that I know what movies you like and in what order better than you do. Those little mole guys creeped me out when I was a kid. As for you knowing more about me than me: We've now crossed over into...The Twilight Zone. Interesting, they creeped you out? Great! That was the point It was a parable about prejudice. Hard to believe there was a time when you could have a story with a message that didn't beat you over the head with it. And no, this isn't the Twilight Zone, just the nature of life. I'm pretty close to omnipotent... or is that allergic? Previous, Dematteis. You meant to say previous. I read a recent article that explains why recent attempts at Superman have failed miserably. It's because they are trying to humanize him. Superman works better as an ideal we would all like to strive to. I thought that was interesting. I think he is an ideal, Douglas, but if he had no humanity, we wouldn't be able to relate to him, Looking at TV and movies, guys like George Reeves and Chris Reeve were able to make the character human, relatable and totally charming while still remaining somehow...other. Of course you don't want to make him TOO human, too much like us. I think there's a fine balance between a kind of Silver Surfer alien otherness and Ma and Pa Kent Kansas folksiness. I think the problem is a too narrow view of what human is. Humanity is more complex than some people give it credit for. Also, don't forget how human and compelling Tim Daly's Superman was. Personally, I agree with John Byrne. John Byrne has said a lot about comics. Some good, some strange, and I certainly disagree with his choice to have little Kal-El be a combination of genetic material who was never actually seen by his biological parents. I do however agree about something, he would think of himself as human... not Kryptonian. This is why Wonder Woman calling him Kal bugs me. The name would have no meaning to him. People get so focused on him being an alien they forget what else he is... an adoptee (which by the way would mean he is a legal citizen). Adopted children are often curious about where they came from, (except in some cases where they can never know and they dive into the history of the adopted family to feel normal, people are fascinating right?) but they almost always still view their adopted parents as their true parents. He think the idea that he has to otherworldly is left over from the attempts to Silver Age where they wanted to flesh out the mythology of Krypton. Conversely, I think the idea that he has to be at war with himself and feeling alienated because of his powers (no pun intended) is a way to just do a quick fix to make him like other popular characters i.e. Batman or Marvel as a whole. However that has the same misconception .about adoption. There is quite a bit of work in making a sharp contrast between Batman and Superman. It is often along the lines of alien/human or power/non-powered or optimistic/pessimistic. If you want a real smart contradiction between the two, that has never been done, with potential for deep insight in both characters and people as a whole it's the fact that Batman is defined by the death of his biological parents where as Superman is defined by the LIFE of his adopted ones. and despite what this might sound like, I am not against the idea of Superman stories about him feeling lost or alone for being an alien. Just as long as what I mentioned is not forgotten. "If you want a real smart contradiction between the two, that has never been done, with potential for deep insight in both characters and people as a whole it's the fact that Batman is defined by the death of his biological parents where as Superman is defined by the LIFE of his adopted ones." Pretty damn insightful, Jack. You're a wise man! Thanks for the compliment, though I was hoping to get your views on some of my other points, but whatever. Just remember Superman's true weakness isn't Superman, it's personal entropy. He's all about his relationships. He came to Earth because of parental sense of sacrifice, he became who he is because of the Kents, and he remains grounded because of Lois, Perry, and Jimmy. For all of Grant Morrison's talk of Super-Gods, he (and the rest) are as far a cry from gods as you can get. I have some more thoughts on the matter, or at least some expansions. As for your point on finding the balance between idea and human, have you ever read "What's so Funny About Truth, Justice, and the American Way?" or seen the animated film (Superman vs. the Elite) based off of it? Its a nice balance between the idea of what superman, and the man.who is living up to it and his place in the world. Nope, never read the comic or saw the adaptation. Sounds like I should check it out! I recommend it. Joe Kelly crafts an interesting story around the idea that there is in fact nothing funny about Truth, Justice, and the American Way. It is almost a western, with the deconstruction inspired heroes calling out Superman. It is actually a testament that although an extra-sized issue, Kelly does in one issue what some might take half a year to tell. Superman's shock at the people agreeing with the new violent villains is great. The film looses some of the gravity and western feel to it, but it is still worth checking out... I would just say that the comic is better. While I do believe that Superman would be better with a lower power level, and less naive and more like Captain America (perfectly aware that there are horrible human beings that can't be saved, but unwilling to let them change his view of the world or checker his nobility) I do think that Justice and The American Way are worth standing up for, and Joe Kelly hit that nail on the head. "Now listen Clark,! This Great Strength of yours--you've got to hide it from people or they'll be scared of you"
"But when the time comes you must assist humanity. Superman is often portrayed as naive. Part of this is because of the Silver age, part ids that many fans discovered him when small and connect him to those feelings of being very young. Personally, I think it would be best to have him be like Captain America. Understanding that some people are bad, that evil does exist, and fulling understanding the darker aspects of life... but, refusing to let it corrupt his belief in redemption, justice, humanity, and honor. Also, depending on the writer, it can seem like Bruce is less concerned about the loss of his parent and more on the fact that they were taken. And there's also an interpretation of Batman where the death of his parents was the motivating factor, but one that he's made (relative) peace with. He's not driven by some neurotic need to work out the trauma of his childhood, he's driven by a sense of human decency and genuine heroism. There was a Justice League story where a demon altered time to show that Bruce Wayne got the crooks gun and killed him. He became Paladin, not Batman and just shot every bad guy he encountered. I thought that was an interesting take as it eliminates Batman's rogue gallery entirely. No villain ever made a second appearance. I think it was a Dwayne McDuffie story. There is no place for decency or genuine heroism in a post-Watchmen world, heroes can only be driven by psychological damage, illness, or trauma that completely dominates the world. A mature world has n need for characters with values, honor, humanity, or characterization other than angst, That's kid stuff, come on Dematteis... you know this. What's fascinating about these characters is that they can be interpreted in many ways and yet, if done right, there's a core that remains the same. Guess that's why they've lasted so long. That is true for more than just these characters, it is all icon, that is what makes them icons. They have a basic concept that is easy to grasp and a complexity that allows more depth and interpretation. Sherlock Holmes, Dracula, King Arthur, Frankenstein, Paul Bunyan, Ebenezer Scrooge, and countless others have the same strengths. Its strange, all the things people remember and last forever are at least somewhat pulpy. Yet, there are still people who look down on it. Even Kurt Vonnegut, who some claim was one of the 20th century's greatest authors, had a fair amount of pulp in his stories. They say Shakespeare was the greatest writer of all time, with his tales with witches, ghosts, murder plots, sword fights, back-stabbing, and vengeance. Yeah, nothing pulpy or comic-booky there. It is even true among less commonly pulp thought styles. Books like Peyton Place and The Dollanganger Saga books are not that far removed from the pulps and comics aimed at girls in the 20-70s, and they had a scandal where they were called trash, and they still get devoted followers to this day. Pulp is power, and some people just hate that. Its sad that they hare seemingly doomed to lose...sad for them at least. Many of Vonnegut's early short stories were sold to s/f magazines and he was often labeled, and looked down on. as a science fiction writer till SLAUGHTERHOUSE FIVE. Yesterday was Alfred Hitchcock's birthday and if you look at his incredible array of classic movies, many, if not most, of them could be labelled as pulp. "Pulp is power." I like that. "Pulp? Fine! Let it be pulp! The woods were full of it!,” words written by Stephen King in the book, "IT" when one of the characters sees it written on a story for a class filled with (and taught by) pretentious literati. King is also probably the most popular writer today, and is also undoubtedly pulp. Of those who he claims as as inspiration 2/3 literally wrote for pulps, Matheson and Lovecraft. The previous even has his shadow cast over his on-pulp stories. I knew Vonnegut wrote sci-fi, and while it was a habit he never kicked, I knew that is where he started. I did not however know he was looked down for it though. As for Hitchcock, remember Film Noir literally took a page from pulps for their stories. They along with Hitchcock thrillers, and sci-fi stories are largely all that are remembered from 50s Hollywood, the era when Movies seem to be dying. There IS a reason for that. Remember the man considered THE greatest American Author, Mark Twain wrote a detective novel, one about time travel, and a tale of a prince and a pauper whose plot has been used in every comic and soap opera that lasts more than a few years. Pulp lasts because you have to know about people, you can't get a way with just regurgitating life as you see it with some observations and opinions. You also have to know how to make it interesting. The real question is why is pulp a dirty concept? Do people hate themselves for seeing greatness in something they may have as a child or adolescence? Sort of a fear that we haven't grown as much as we would like top believe? IS it a cycle of authority figures in pour youth drilling in what is and isn't good? In this country is it because we are young and want to prove ourselves? How far back does this cycle go, and is it all related? Shakespeare and theater at large were despised, but what about after that? Twain and Dickens were beloved, but was Sir. Arthur Conan Doyle looked down on in his time? Or Robin Hood? Great point about Twain, Jack. I'm not sure Robin Hood was originally in novel form. It was a joke, Jack. You listed Robin Hood after Dickens and Doyle as if he was a novelist. Just want to be clear about that! No fault at all, Jack. I was just making a little joke. I remember when I was one of Stephen King's 'Constant Readers'. If he wrote it, I read it. That has fallen by the wayside. I never finished The Dark Tower series and his last book I read was From A Buick 8 and I liked it, but I find the older I get the more older, pulp I read. Old Hard Boiled Crime Novels, The Avenger, stuff like that. And comic books. I will always read comic books. Oh, and books about Templar Knights. That stuff is just fascinating. I devoured King in the 70's and 80's, Douglas, then lost track of him. A couple of years ago, intrigued by the premise (I'm a JFK buff), I picked up 11/22/63 and TOTALLY loved it. One of those books you want to start over again as soon as you finish reading it. If you haven't read any SK in a while, 11/22/63 may be your door back in. You would be the second person to recommend that book so I may have to dig it up and read it. Thanks for the recommendation. I did just reread my favorite King book, The Dead Zone. Such a great book. DEAD ZONE is my favorite King, too, Douglas. At least it was till 11/22/63 came along. I'd say they're tied for first place. SUPERMAN, BATMAN AND WONDER WOMAN—OH, MY!